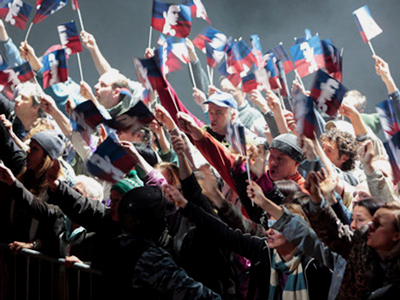 MUNICH — Bavarian State Opera’s flag-waving, Putin-skewering production of Boris Godunov had extra resonance in a revival on Sunday afternoon (March 16) as Crimeans engaged in their foregone conclusion of a referendum. Musically, too, all emerged tougher and more urgent than at last year’s premiere. Kirill Petrenko sharpened the orchestral colors and summoned thrilling, even frightening, contributions from the chorus (trained by Sören Eckhoff), a welcome shift from the norm here. Mussorgsky’s opera found its climax under this conductor in Scene VI, before what should be St Basil’s Cathedral, the Holy Fool (Kevin Conners) intoning sweetly around the people’s acerbic cry for bread: Хлеба, хлеба! Дай голодным хлеба, хлеба! Anatoli Kotcherga re-graduated from Pimen last February to a title role he owned twenty years ago, his voice undiminished but for some missing support in soft passages, while Ain Anger brought virile ardor to the chronicler. Vladimir Matorin railed and whimpered definitively (again) as a drunken Varlaam. Dmytro Popov introduced a sonorous Grigory, and Gerhard Siegel and Markus Eiche repeated their effective Shuisky and Shchelkalov. Although lamely led by Kent Nagano, BelAir Classiques’ just-released DVD from the 2013 run preserves Alexander Tsymbalyuk’s magnetic, gloriously sung Boris as well as Matorin’s perfect Varlaam. Stage director Calixto Bieito uses the 1869 score, so seven scenes and no Marina or Rangoni. This entry was posted on Wednesday, March 19th, 2014 at 11:19 am	and is filed under Munich Times. You can follow any responses to this entry through the RSS 2.0 feed. Both comments and pings are currently closed.